Distribution of Active Users in OpenStreetMap – Oct-Nov 2012 : Neis One! 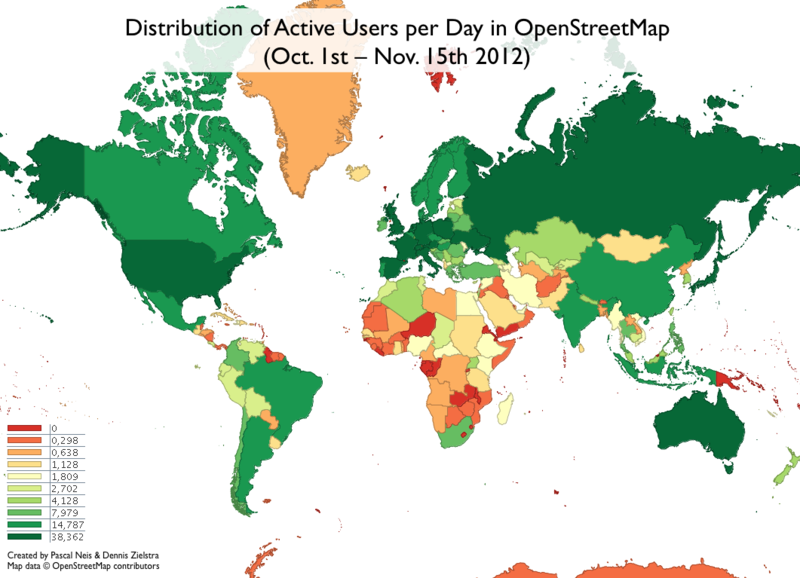 Overall the maps show a slightly similar activity pattern of the OSM users as in our previous results two years ago. The major concentration of the project still lies in Europe expanding more and more to the east. However, you can see certain changes in other areas of the world too. First improvements have been made in Africa, South America and South-East Asia. Greenland of course is looking quite exceptional due to the low population value. So, what do you think? Where are you located and how would you describe the mapping activity development in your country? As somebody living in india, I shake my fist at you. 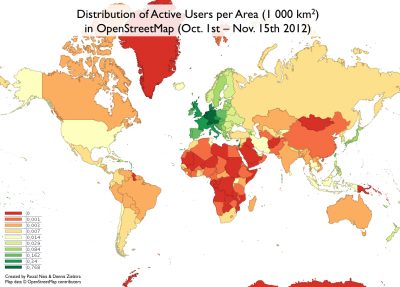 Could you also made a map with active users per Area? Thanks for your comment. I added a new map which takes area in consideration. Would be very nice to have area preserving maps (equiareal) like in the odbl.de statistics¹ because conformal maps are of no use in this scenario. 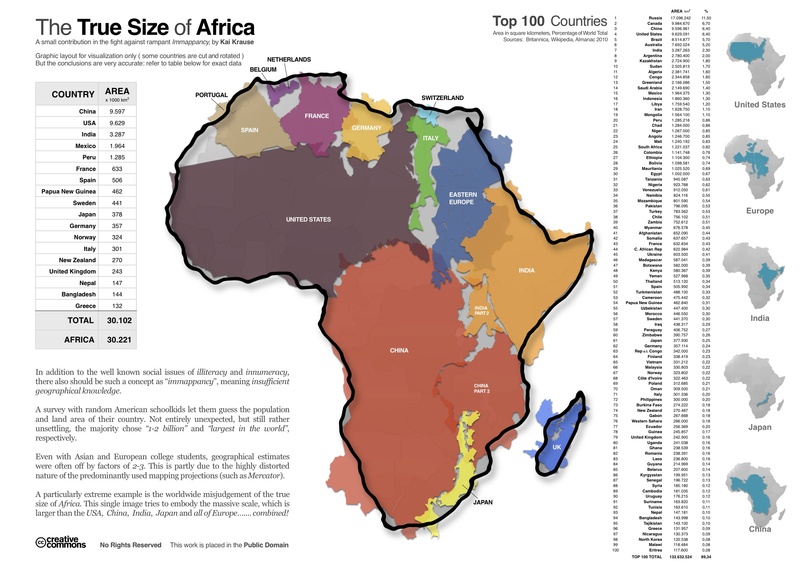 Equiareal maps would make it much easier to imagine the ratio between mappers and countries inhabitants/area. ¹) http://odbl.de See at the middle of the main page. That is why I think it is crucial to have equiareal maps in your stats. Very nice charts… However I have a (small) doubt about validity of your Distribution of Active Users per Area. Roughly, the active user/km² should be about the same while we get x3 for France. Have you compared to real km² ? There seam to be a distortion due to some merkator projection when you go farther north. Hi Sly, 40k for France and 15k *active* Users for Finnland? 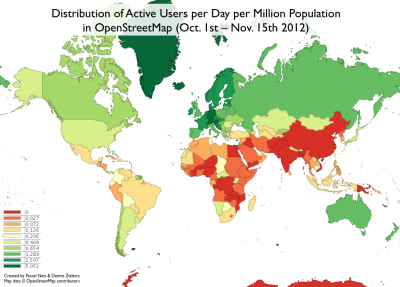 Sorry, but that can not be true 🙂 As you can see it in the maps, it’s about “daily active users” per country, population or area. Maybe I should have a given a few more seconds when writing those 😉 Those figures are copied from your first chart but I thought the comma “,” was only used as the unit/decimal separator in french, and I thought it was the “thousand” separator in english. So I guess your chart with 38,362 means 38.362 ~ 38 active users per day ! However, my comment takes into account the ratio between France and finlands, wich means it might still be true. > France has an average of 232 contributors. I then assumed since there wasn’t a 32->64 step that all “dark green colored countries” were between 32 and 64 wish was a wrong supposition. What do you mean by “Users”? People who edit the map or people who just look at the OSM website?